This is an industrial building with a very interesting evident stonework, simple and strict arrangement of morphologic elements on the facets and the tile-covered roof. The stonework is interrupted by stone false-columns and the use of iron on the facets is characteristic. Its ground plan is trapezoid and its entrance is placed on the lateral side of the trapezium. It served as a hat factory for a long period and it is connected to the life of the local community, consisting a significant place of reference for the area of Thission. 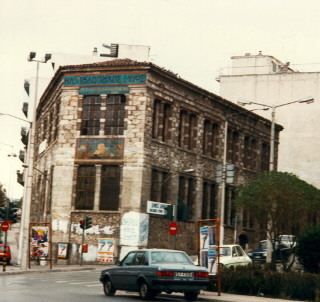 By a ministerial decree of 1985, the buildings were identified as preserved monuments since it is considered to be a remarkable sample of industrial architecture. The building has been completely restored and bestowed to the City of Athens to serve as a multi-purpose cultural center.